Daphne Oram - An Individual Note of Music, Sound and Electronics. Bleep. There's no doubt that Daphne Oram is one of the most important musicians and technicians the world has ever seen. 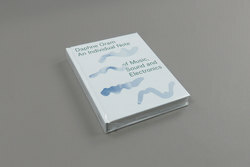 An Individual Note of Music, Sound and Electronics pieces together an essential history of Daphne's career with the BBC Radiophonic Workshop and her work pioneering drawn sound synthesis. An incredibly important milestone that should be digested by anyone with even a passing interest in electronic music. Every home should be with a copy. As crucially interesting as it is crucially important.